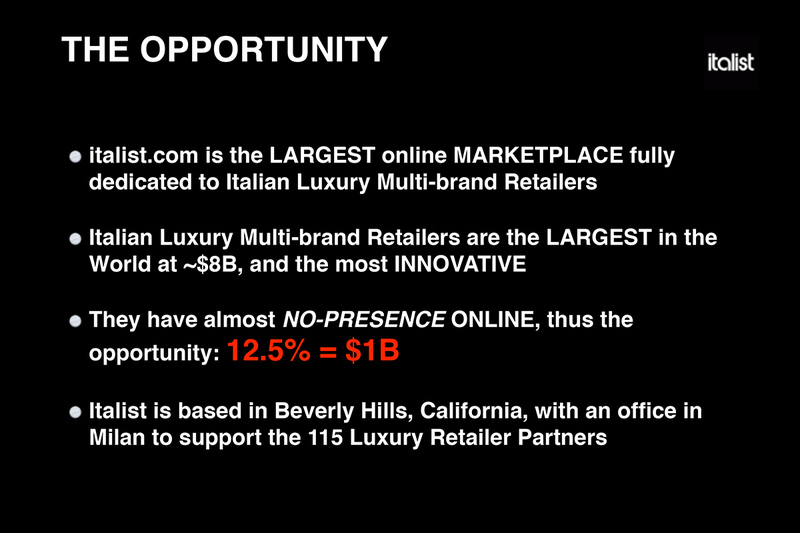 Italist is the first online marketplace for the $21 billion Italian personal luxury goods market. 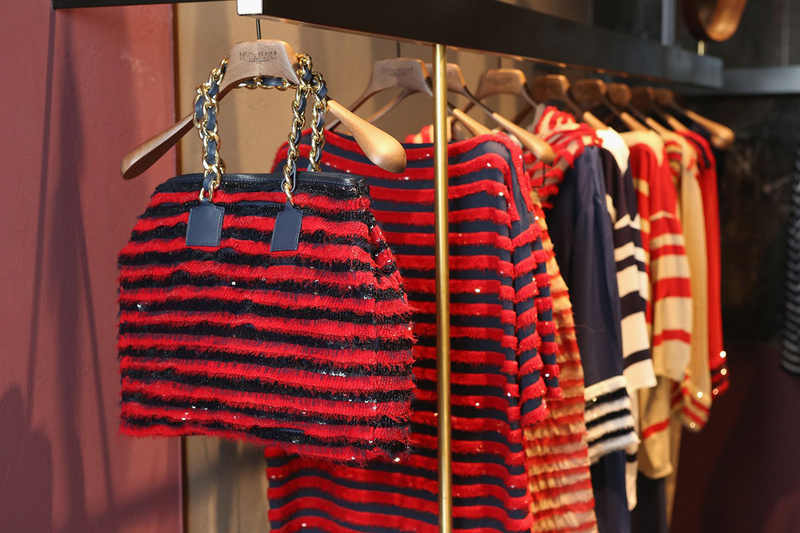 We list products that are held in-store by boutiques like Gucci, Valentino, Ferragamo, Dior, Saint Laurent. Items we sell are on average 30% cheaper than any other competitor due to the peculiar structure of Italian retail market (no importers, no distributors,…) and some of them can’t be found anywhere else online, and we have the broadest selection of Italian luxury items on the internet. 1 $1,500,000+ revenue in May. 2 60% growth quarter over quarter from Q4 2014. 4 Founders sold last company for $80M. 5 115+ partner boutiques, sold in 85 countries. 6 Italist holds no inventory, leverages inventory of partners. 7 Italist is already at break-even. Founded Zero9 (business in 12 countries) which sold for $80M and two other successful startups. Worked at Bain & Company and Diamond Cluster after earning his degree at Bocconi. Formerly CEO of Sleepy Giant, negotiated sale of Zero9 for $80M, VP of Finance for Activision Blizzard, Principal at Bain, Finance Group Manager at P&G. Speaks four languages. MBA from Cornell. They’ve used the year since they last raised on Wefunder to grow revenue 4x and hire a stellar team, with ex Googlers joining as the VP of Technology and Director of Development. The team has generations deep experience in personal luxury, and the founders grew their last business from nothing to tens of millions in revenue, finally selling the company for $80M in 2008. By listing the latest collections of luxury brands, generally at the lowest price online, they attract luxury consumers around the world, and the fact that they’ve done this by implementing a proprietary system to onboard boutiques means that it will be hard for competitors to replicate. They also understand that buying luxury items is an experience, not just a mere transaction, and are building features that will make purchasing through Italist feel amazing. Despite the brand recognition of Italian luxury fashion brands like Dolce & Gabbana, Prada, and Valentino, there is no online aggregation of exclusively Italian luxury fashion. 500 Startups-backed Italist is trying to change that. Racked purchased a Gucci belt offered on Italist Selection to see if we could learn more. After an easy online ordering process, the belt arrived in less than a week, in a Gucci dust bag, and in great condition. Public company w/2B merchant cap. Portfolio includes Luxola ($10M invested), Zazzle ($30M), and Coremetrics ($60M). Bocconi University Professor. Family owns famous Etro brand. Owner and President of Banca Mediolanum. Former CEO of Fiat South America (now FCA). Owner of fashion brand. CMO for Cartasi. MBA from Stanford. Interested in startups that have an unfair advantage over competition in a big market. 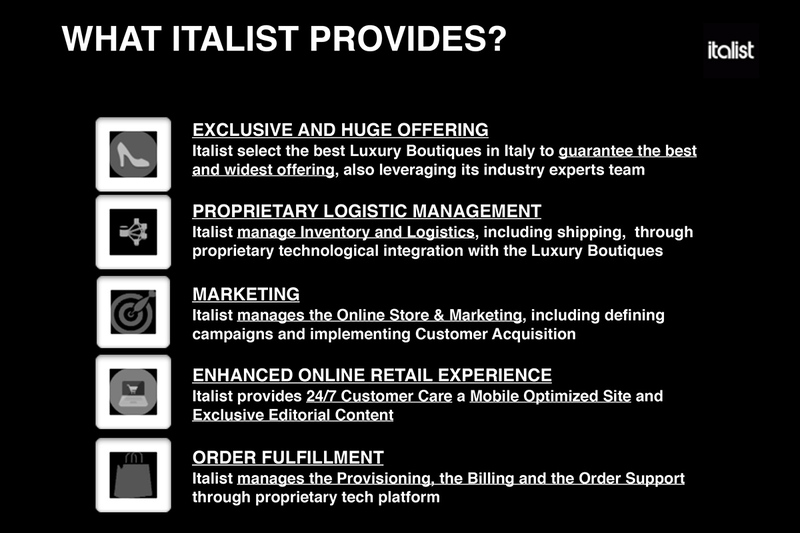 Italist leverages the $9B Italian luxury multi brands store offering, the biggest in the world for value, to customers in 85 countries, with a proprietary integration to its online platform. Italist manages inventory updates, lists items online, implements marketing and customer acquisition tools, and subsequent fulfillment and delivery to customers all over the world. Italist selects the best Luxury Boutiques in Italy to guarantee the best and widest offering , also leveraging its industry expert team. Italist manages products updates, pricing updates and logistics, including shipping, through proprietary technological integration with the luxury boutiques. Italist manages the online store and marketing. We provide editorial content, photos, and implementing customer acquisition tools. Italist provides 24/7 customer care and exclusive editorial content. Italist manages the Provisioning, the Billing and the Order support through proprietary tech platform. We've partnered with over 115 of the most recognized and beautiful stores in Italy to source the best selling fashion brands in the world. Italist is a marketplace for over 115 boutiques in Italy. Italist earns 20/30% on the net revenues of everything they sell without any of the inventory risk. 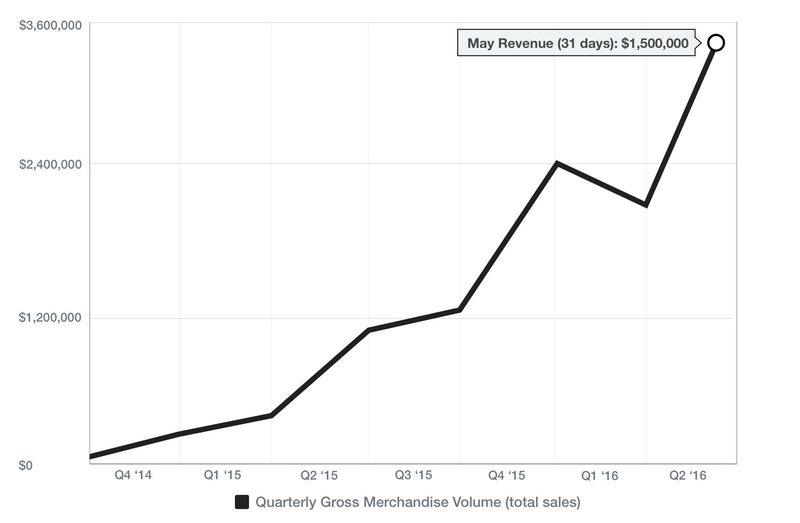 In the last 20 months Italist has grown monthly revenue more than 30 times from under $50,000 to $1,500,000 in May - months ahead of the holiday shopping season. We plan to be the online destination for luxury shopping. Luxury brands and retailers partner with Italist because we make it so easy to sell the newest collections to customers all over the world. Italist shoppers love us because we provide them access to the latest luxury selections at a lower price, including items rarely available outside Italy. Our model is the future of ecommerce: huge selection without carrying any inventory. Think Etsy for the luxury market, with the most famous brands. We are building the first online marketplace for Italian luxury boutiques. We provide them with everything they need to sell clothes, shoes and accessories through our site, from Italy to the 85 countries we have already sold. This allows us to give our customers an extremely broad offering without carrying any inventory ourselves. Also, by partnering with luxury boutiques we can offer products that can’t be found anywhere else online. In addition to all the French, Italian, American, Japanese (and so on) established brands, we have already started working with emerging brands, and plan to become the online channel for most of the luxury brands that launch in Italy each year. If you are looking for one of the $21 Billion of personal luxury items sold in Italy each year, we are the place to find it online. We were observing the queues of tourists outside some of the main luxury boutiques in Italy during “normal” days. Usually, you would see that amount of people outside only during the first days of “discounts” - sale season in Italy is regulated and each city decrees the beginning within an approved calendar. The reason was the combination of products hard to find and lower prices even at full retail (no discount). Once the technology and the online buying matured we still noticed the gap on luxury sales. In fact, only 4-5% were transacted online (now 7%) despite the global appeal and knowledge of the brands. Moreover, most of the transaction online where from retailers who owned their inventory, thus limiting their ability to scale offering, and the overall space was relatively empty. It was a go. What problem are you solving for your customers? If you go to Italy you can have a great shopping experience; however, the vast majority of luxury boutiques don’t have a website, so when you come back to the US, it is almost impossible to buy the products you liked. So we really provide our customers three advantages. Broad selection, better prices, and access to unique items that can’t be found online anywhere else. The first advantage is selection. We will be broader than Neiman Marcus by the end of this year. We can do this because we list the inventory of each one of our 115 luxury stores, and carry no inventory risk ourselves. Thus, our customers can find the products they desire at italist.com before everywhere else; for example, we had Cambiaghi way before you could buy it at Barney’s. The second big advantage is lower pricing. Generally, the same product is 30% more expensive in US vs. Italy and this difference even increases in Far East where the price positioning of some brands is 40%, 50% higher than in Italy. Lastly, we carry limited edition items and very specific SKUs that are impossible to find anywhere else. For example, we have a luxury partner that carries a specific line of Alden shoes that is only sold in one shop in Italy. The same is true of the dedicated Italian lines of Santoni, or Golden Goose that are impossible to find in Japan and Korea even though these brands are very popular there. We also have at least 10 brands that list with us directly that you can’t find anywhere else. What % of your sales come from items that can only be found on Italist? Not only we have a good portion of sales that derives from unique items, we are also the most convenient way to buy in countries where there are little or no alternatives to online sales. I’ll give you an example. Yesterday we sold items in Kazakhstan and Azerbaijan. Over there it is almost impossible to find a Valentino, Gucci, or Dior bag. These countries all have a wealthy portion of the population that want access to those brands, but they can’t find them. Basically there options are to fly to Italy, or buy from Italist. Why can’t customers buy these items from the brand’s websites? Few luxury brands seriously use their websites to sell. They are focused on providing highly branded in-store purchase experience. For example, Prada sells less than 1% online and the product line that they sell online doesn’t generally overlap with the products they sell through physical distribution. Who are your customers and how much to they buy? Right now, our customers are 80% female, between 25 and 55 years old. We already sell in 85 countries. The U.S. is 40% of our sales, followed by Hong Kong, U.K., Korea, Japan and so on. Our average transaction is $600, and in some months up to $700. Usually the process of buying involves repeat visits to our site. But, once they buy, they tell their friends, so we are seeing a lot of organic traffic and word-of-mouth growth. We also have great retention. Over 12-months, 35% of our customers buy again, which is very high given our average transaction size. Basically, you do not buy a Valentino bag every week. It’s a couple of times per year if you’re a real fashion addict. The numbers we are seeing are already close to the market average, so, Net-a-Porter and the other big players have more or less the same customer behavior, and as our selection increases, we should be able to drive this up. How do you integrate with boutiques? Boutique onboarding is a critical process. One of the risks of our business is showing an item online that doesn’t exist anymore in the inventory of our boutiques so we’ve done some hard work to make sure that doesn’t happen. 1/ We have developed a specific app to use to keep listings up to date. Every Italian has a smartphone. We give them an easy way to print out a QR code that they put on each product that they scan with our app each time an item is sold, updating the listings we show on Italist. 2/ If they have a small presence online, we also integrate their product feed on our site. 3/ We can also integrate with their inventory management software through an API. The boutique on-boarding process requires a training program that we have established, providing also an online manual and live coaching. We explain and detail all the processes from the printing to the QR codes, to the online confirmation of the order and on how to prepare the packages with our boxes and material. What happens when an item is purchased on Italist that’s no longer at the boutique? We’ve already been able to get the number below 5%. To note that the customer isn’t actually charged until we confirm that the item is available. The customer is immediately notified with our apologies and a personalized token. We are working hard to bring this number down to zero so we can grant them the best customer experience possible. Why are boutiques willing to implement such an invasive process? They increase vastly the potential customer base, since we sell in 84 countries and we start to have brand presence among the luxury consumers in US. This translates in significant improvement in their sales. They can’t decrease the number of products they stock because they need to have an in-store offering that is attractive enough to keep customers coming back to the store. By listing with us they decrease the risk of having unsold products at the end of the season, that reduce drastically their margins. We take ~20% of each transaction on Italist. With an average transaction size of $600 that is $120 per purchase. Why is Italy the best market to do this in? 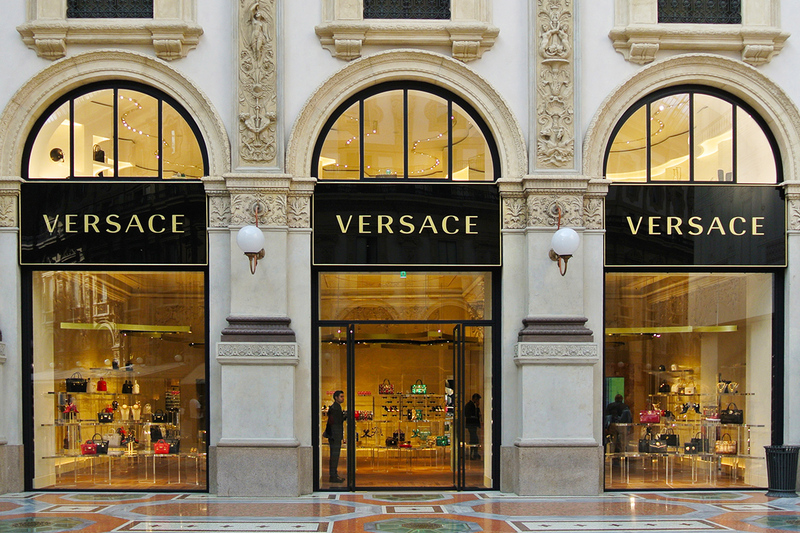 Italy has the largest market for luxury multibrand stores, at $9B and is one of the country more visited by tourists as well. This translates in two main factor for us, the biggest supply base in the world and the buying ability to sell to a worldwide customer base. All our partners always did a significant part of their sales in store with non-Italian customers, thus they are used to buy for a more global customer base and to introduce new trends. As an additional bonus factor, the “made in Italy” is still the most important connotation in the luxury world for clothing and accessories, our market. How do you deal with returns? Our customers can exchange any product that they are not happy with. We have a return rate that is below the average of this luxury market, at ~6%. How many brand and boutique partners do you have? We have 115 luxury boutiques on board, we are continuing to sign 1 to 2 partners per week, with an overall target of 250-300 luxury boutiques on board by the end of 2017. Here is the relevance of being in the largest market in the world for multi-brands luxury stores; when we will reach $300M in Gross Sales that would translates in an average of 12 sales per day for our 115 partners, or, maintaining the 12 sales per day average, to $780M in Gross Sales with 300 partners. At the moment, only few of our partner luxury stores uploaded a big portion of their offering, since the full onboarding process requires a longer time frame. If the current partners would upload all their inventory we would have 200,000+ items, the largest luxury presence online (for reference, Neiman Marcus has 30/40,000 items online). Is it more important to scale the supply or demand side first? We need to keep both sides of our customer marketplace happy. We have focused primarily on building relationships with the boutiques since that is our largest challenge, and we need to have the listings in order to attract customers. Now that our revenues are growing, the boutiques are very happy and we’re going to focus on growing our customers. Can you replicate the experience of buying in-store, online? We think so. We are in the process of redesigning the website. Each one of these brand’s pages will have a deep storytelling component: Interviews with the designer, a video explaining how the product is produced etc. Consider that most of the international brands are produced in Italy — Louis Vuitton or Givenchy, most of the big French brands have the production in Italy. That is because of a tradition from hundreds of years in producing luxury. We have also implemented a customer concierge feature that helps customers through the steps from when they see the products all the way through purchase; also improving conversion. Why aren’t the major brands selling more aggressively online? The luxury fashion business has a distribution system that has been built over a period of time when internet did not existed and companies had local management. Moreover, the luxury brands are reluctant to sell online because they consider that experience not consistent with the brand experience they want to offer in their stores. We believe that this will progressively change but they would always have a channel conflict issue with their brick and mortar retailers on offering overlapping. How do you think about the market? The market size for personal luxury goods is $340B per year. The retail Italian market is $21 billion per year, and ~40% of that goes through multi-brand stores. or $9B. Let’s imagine that we get 12% of that and we are above $1B. 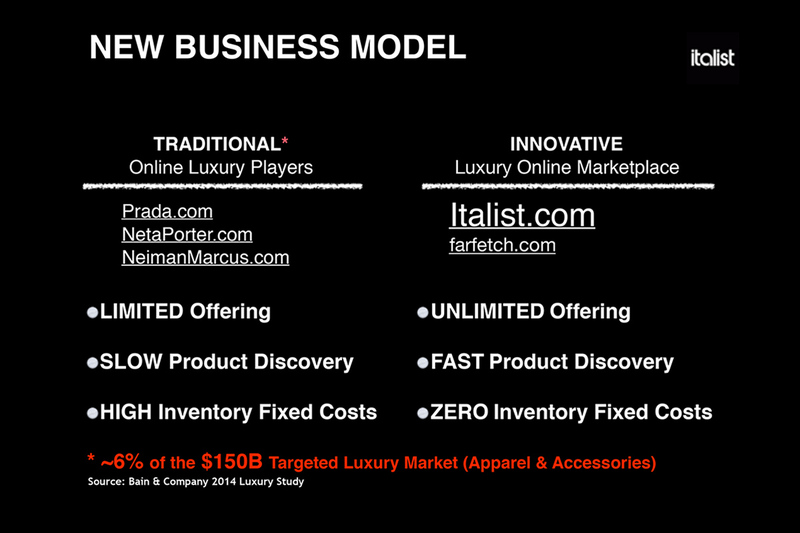 Moreover, the luxury market for apparel grew 3 times in the past 10 years, while growing 10 times online. Expectations are for online sales to grow 4 times in the next few years. We are going to be part of that big growth. How do you acquire customers and what does it cost? Right now we are using online vertical channels where we have an acquisition cost of $60 per sale. We are profitable on the first sale and 35% of these buyers repeat during the next 12 months. We are also focusing on SEO and we do significant work there, hence our organic traffic is very significant. What did you do before Italist? We met working together in Bain in 1998 and shared few cases, but we were already talking about luxury and tech. We met again during, working together on the very successful exit to a private equity fund of Raffaele mobile content company. Prior to Italist, Diego was the CEO of a tech company, here in Southern California, participated by TPG Capital and had executive positions at Activision Blizzard and Bain; he was also Board Director of one of the most famous luxury producers of knitwear in the world. Raffaele was a pioneer on mobile content in Europe, he bootstrapped his company and grew it to a $80M in seven years with operations in 3 continents and 12 countries. After that, he became involved with few startups that grew to be successful. Raffaele, also, was raised in a family that for generations had a business in luxury. Why are you guys the team to do this? We believe that to succeed we need the unique skill-set combination of luxury and tech, that we have, plus the ability to manage multinational teams in key areas, that we also have developed, working in complex organization while living in various continents. We have our tech team in San Francisco with some senior developers that worked already with Diego (and Google...) and are capable to understand the coding part as well as the business; we are based in Beverly Hills as well as the marketing team, while we have our partnership, onboarding and support Teams in Italy, to better source the products and leverage our relationship with key experts and players. Our customers usually would choose between us and the Brand’s own website or a retailer like Neiman Marcus. We have a much wider selection of items than any of these sites, unique items that can’t be found anywhere else, and we often offer better prices. In terms of marketplace for luxury boutiques there is Farfetch, that is partnering luxury stores around the world and has already a valuation of $1B; however, because of the difference in sourcing we have often a price advantage. Italist is conducting a Regulation D offering via Wefunder Advisors LLC. CRD Number: #167803. Sometimes, the very thought of braving weekend crowds in the malls (all over the country, no less) is enough to make you crawl back into bed and throw the covers over your head. Fortunately, this being the digital age, we can get all our beauty and style needs - from the comfort of our own bed no less. Si sa la moda italiana è un brand famoso in tutto il mondo e per questo due startupper italiani, Diego Abba, Raffaele Giovine, Andrea Milani e Giuseppe Sacco, emigrati in Usa da diversi anni, hanno lanciato Italist, un e-commerce che aggrega i prodotti di 120 boutique italiane: "Vogliamo dare a tutti la sensazione di fare shopping nei negozi di moda di Milano o altre parti di Italia" spiegano i founder. This Site Offers Luxury Goods at Impressive Prices, But Is it For Real? "You can't find it here," she'd say of her body-hugging magenta dress with all the cutouts, encapsulating the entirety of these United States of America in a syllable - "here" - and a shrug. "It's from Italy." Some of her clothes were produced by big name designers, while others bore Italian-named labels we'd never heard of. The platform allows retailers to take full control of what they put in Italist’s virtual mall, taking their own photos and selecting their inventory. Plus, Italist encourages their retailers to include extra information on their pieces, including materials used, the story of how it was designed, or the history of the brand itself. This is the second article in a series on foreigners working in Korea's technology start-up ecosystem. ― Ed.Tech industry pundits in Korea used to joke that this is where overseas companies would come to die. Through Italist, Italian boutiques, artisans, and emerging designers are able to gain distribution and sales. COSA Nasce la collaborazione esclusiva tra il marketplace di moda italiano italist.com e i siti di Hearst Magazines Italia elle.it, marieclaire.it e cosmopolitan.it con. This company is based in Mountain View, but its focus and founders Raffaele Giovine and Andrea Milani are all Italian. It offers an online marketplace for luxury independent fashion retailers and emerging Italian fashion brands. The company is already doing about $2 million a year in business, selling high-margin items and growing at about 50 percent per month. Italist, is a marketplace for high-end fashion multi-brand boutiques, new talents, and emerging Italian brands. Mattermark Growth Score: 703. Thanks for vouching for Raffaele! If you'd like to invest in Raffaele, please open an account. We'll waive your fees if you do it now. We asked Raffaele for 10 personal references. Can you vouch for Raffaele?